A video on what to look for when purchasing your room divider. View the Screenflex Advantage! While searching for a portable room divider may seem like a simple task. It’s important that several key items are on your checklist to ensure you invest in a high-quality, long-lasting room divider. 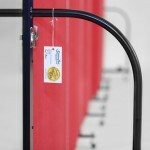 Screenflex portable room dividers are more stable, and therefore safer than competing systems. The stability of a portable divider comes from the end supports along with the casters that run the length of the partition. The width and weight distribution of the end supports are key factors in making a safe and stable product. Screenflex end-supports are 3-inches wider than competitive systems and have the greatest weight and length at the base of the frame creating a low center of gravity. Screenflex systems uses steel end-support, while other systems use a light-weight aluminum panel on the ends. This not only makes competitors panels lighter but also distributes the weight evenly at the top and bottom which creates a less stable product. It is also important that casters be in contact with the floor in order to be weight bearing. If a caster is not touching the floor it is not supporting the partition. Screenflex has exclusive self-leveling casters which ensure that each caster makes full contact with the floor. Other systems use fixed casters which inevitably result in unstable partitions similar to a wobbly table. Screenflex proprietary spring-loaded position controllers snap into place to hold the panels in the desired configuration. Other systems have no means to hold the panels in place one they’re setup. Screenflex panels have two separate layers of fiberglass between the fabric and the inner core of the panel. This not only makes the panel stronger, it also absorbs more sound than competing systems that have just a single layer. Made in the USA, Screenflex uses full-length piano hinges, which are connected every four inches, top to bottom. More panel-to-panel connections means a stronger longer-lasting divider. Competing systems connect their panels with an exposed gear mechanism in only two locations. Screenflex uses a molded storage latch which automatically locks when you fold the partition for storage. Competing systems use an awkward rubber strip underneath the unit that has to be manually engaged. The Screenflex stabilizing end-supports also provide a safe and efficient way to move and store your dividers with clear vision. Competing systems with a full-panel end support block your vision when moving and require 33% more storage space. With Screenflex, every detail equals quality construction. Like our optional steel multiunit connector which allows you to create multiple partitions to create longer lengths. Competing systems use a piece of velcro. Screenflex stands behind its products with a money back guarantee. Competing companies charge a restocking fee of 25% or more. For more than 25 years, Screenflex has been manufacturing the highest-quality of long-lasting portable dividers available. Our expertise and commitment to excellence over the years has allowed us to provide this checklist of specific characteristics related to quality, functionality, and safety that no other product can offer.